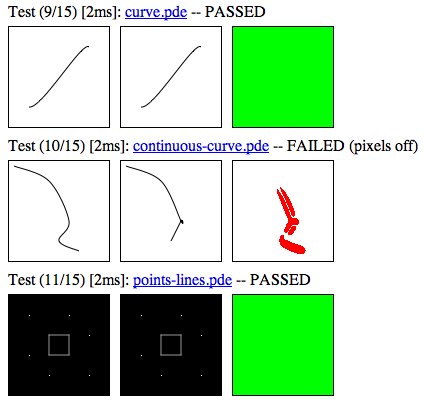 Today we finished final testing for Processing.js 0.7 and released it for download. It represents a lot of hard work by an ever growing community of developers. This release once again focuses on feature parity with Processing, as well as bug fixes. We've added some big new features, like PImage and image loading, as well as support for Processing's synchronous loading model in the browser via a new language directive. We've also continued to finish WebGL-based 3D support, adding beginCamera, endCamera, curveVertex, dist, curve, ambientLight, pointLight, noLights, directionalLight, and box. Our roadmap for adding full 3D support is just about at an end, which is a great feeling. We've also worked on many parser, language, and API bugs that people have been submitting (thanks to those that are filing them). Write a visual test (processing code) and make sure the native Processing (Java) and Processing.js are the same (visual inspection). Generate a ref test using a web-based tool. The ref test is made by running the code, then extracting pixel data from the canvas and putting it in a comment in the code. The file is then saved (code + bitmap pixel data) to a .pde file. A web-based ref test runner reads in the test files and does 3 things. First, draw the pixels back to a canvas using ImageData and putImageData. Second, run the processing code to produce a live sketch. Third do a visual pixel diff, comparing the two canvases. This technique is already saving us a lot of time as we test our code on Firefox, Minefield, Safari, Chrome, Opera and on Windows, Linux, Mac, and mobile OSes. I think other people doing visual work with canvas should explore this method. You can try it out for yourself here, and see code here. Thanks to Andor, Yury, and Corban for their work with me to get this working.